Combine young man style and the world of business and you'll have the modern fit suit. A modern fit suit is the perfect style suit for the young man to wear to work and still be work friendly. You'll find that these great looking suits look and fit well tailored right out of the box and just need hemming for the pants. 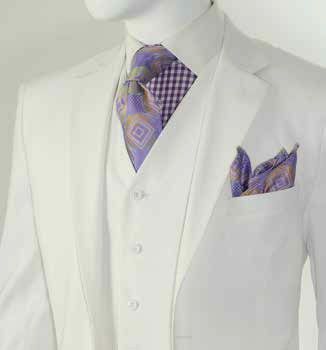 This solid white 3 piece suit has that clean look which is perfect for a white party in the summer or special occasion where a white suit is necessary. The pants are single pleat style and the vest is the icing on the cake. Made of fine poly/rayon fabric with a fine wool feel.